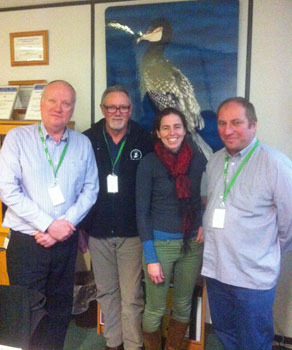 Chief Islander Ian Lavarello joined UK Tristan Government UK Representative Chris Carnegy and UK Adviser Jim Kerr for meetings at JNCC and RSPB offices on 9th December with the main topic being the future eradication of mice on Gough Island. 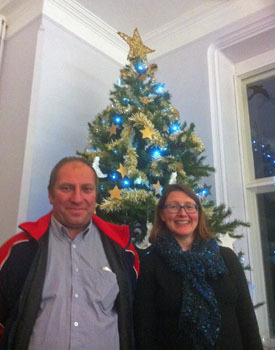 Right: Ian with RSPB's Claire Stringer. and below for a Reception hosted by the UK Overseas Territories Association and attended by Ian. with the County Hall and the London Eye behind. 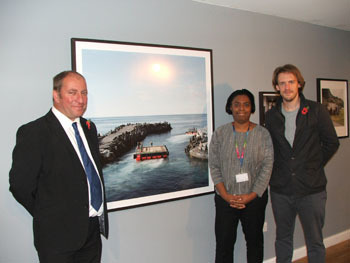 Chief Islander Ian Lavarello toured photographer Jon Tonks' exhibition Empire being staged at the Midland Arts Centre in Birmingham in November 2014.
on the Tristan News Abroad page. 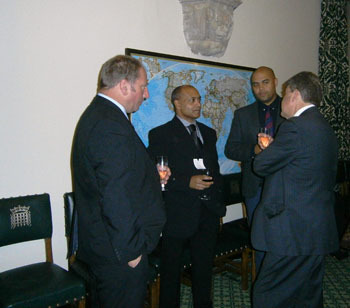 Tristan da Cunha Chief Islander Ian Lavarello was applauded by Parliamentarians, former Governor of Overseas Territories and guests at a reception on Tuesday 4th November 2014 to mark the 20th Anniversary of the UK Overseas Territories Association, of which Tristan is an active member. 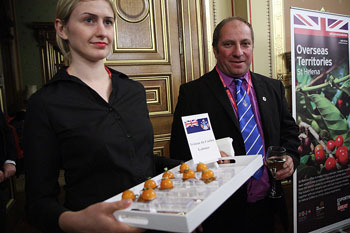 The event was held in the Palace of Westminster in London, enabling MPs and member of the House of Lords to be present. Chairman Albert Poggio, Gibraltar's UK Representative, pointed out no-one had travelled further than Ian to be be present – though he did make the point he was in the UK for the Joint Ministerial Conference and for meetings with stakeholders, politicians and civil servants. 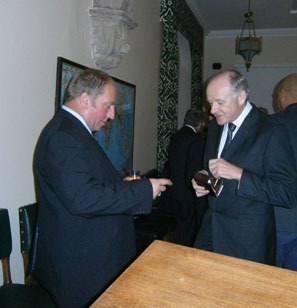 Mr Poggio was supported by Andrew Rosindell, Chairman of the All Party Parliamentary Group on the Overseas Territories, who said UKOTA had succeeded in raising awareness of the Territories and their contribution to the life of the United Kingdom. 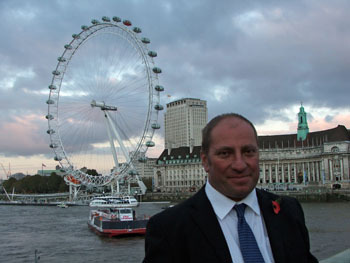 Ian Lavarello said: “I was particularly pleased to be able to thank good friends of Tristan such as the former Overseas Territories Minister, Henry Bellingham and politicians and officials from Gibraltar who have been so supportive of Tristan’s concerns over the harbour and the future of the island. The Territories which are members of UKOTA and their leaders have all supported Tristan's calls for a new or replacement harbour to safeguard the future of our community and it was good to be able to tell so many influential people why this is crucial for us”. Ian Lavarello with guests at the UKOTA 20th Anniversary Reception in the Commonwealth Parliamentary Association Rooms in the Palace of Westminster. 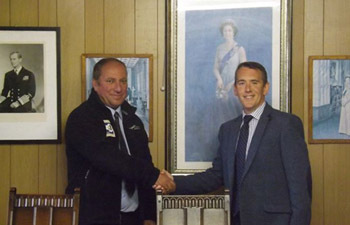 Photo: Andrew Mackinlay, HM Government of Gibraltar London office. 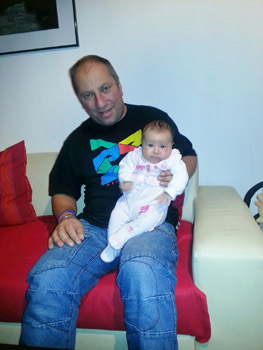 Chief Islander Ian Lavarello returned to Munich in Germany 7th-10th November 2014 to visit his relatives the Leitner family. 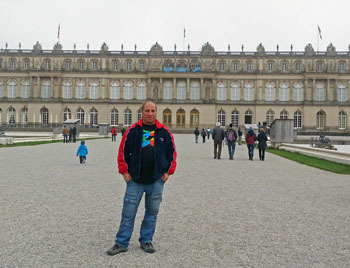 Mariah Leitner (nee Green) reports that the family took Ian to visit the Royal Palace of King Ludwig II of Bavaria which is situated on an island in the Chiemsee, Bavaria's biggest lake, some 60kms SE of their home in Munich. 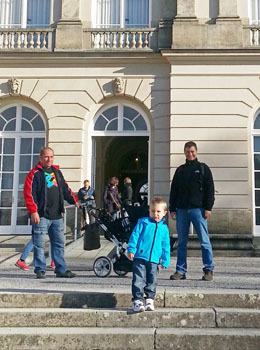 Below left: Ian with Marko and Mariah's daughter Amelia. 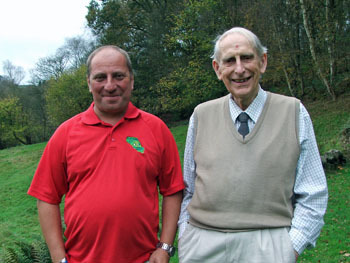 with photos on our 2014 Family News Page. on our 2014 London JMC page. 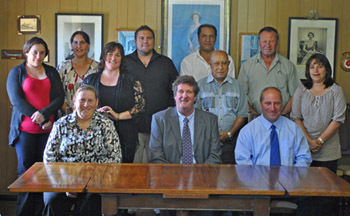 Photo shows the newly elected Island Council at their first meeting on 11th March 2013.